Last week, DMS Holland and De Boarnstream International Motoryachts from Jirnsum came together on one of the Netherlands’ most beautiful islands. During a sea trial for the German magazine ‘Boote’, the Elegance 1500 CS (Centre Sleeper) (MY Li) sailed, under the Swiss flag, in and out of Vlieland’s ‘Waddenhaven’ several times. In collaboration with D-Vision from Oss and the well-known Dutch top photographer Peter Smulders, beautiful footage was made for the promotional film which will soon be shown through various websites and social media channels. From a robust and sturdy rib called Ocean King, photos and film shots were taken. In addition, sea trials of the Elegance 1250 Sedan (MY Lady Wiedwin ) also took place. Both MY Li and MY Lady Wiedwin are equipped with MagnusMaster stabilisers. “In hindsight, stabilisers are actually very useful. With only the rib to take footage from, it was impossible to make stable footage”, says Peter Smulders. “As a yard we are very satisfied with the stabilisers that DMS has already supplied to many of our Elegance models. Even this Elegance 1250 Sedan is now equipped with a MagnusMaster one rotor system. In fact, almost no Boarnstream ships are now sold without the DMS system”, says Henk Hokweda, founder of the shipyard which is now more than 50 years old. 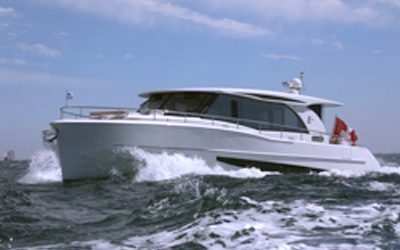 During the pleasant stay on car-free Vlieland, DMS Holland received another two new orders from the shipyard, namely MagnusMaster systems for the Elegance 1400 CS and Elegance 1360 Sedan. “I would never want to sail without stabilisers myself. On the way from Jirnsum to the Hanse Ancora Boat Show we sailed a stretch over the Baltic Sea and switched the MagnusMaster stabilisers off for a moment just to see the difference. It was only a matter of seconds before the system was very quickly switched back from park to stabilising via the touchscreen”, says Lilo Schäppi, owner of MY Li.